When you’re working on math with younger children it’s really important to start with real things – objects they can hold in their hands and use as they play and work with mathematical ideas. They need to have a solid understanding of the concept that a written down ‘1’ actually means one car, or one block, or one bottle top. 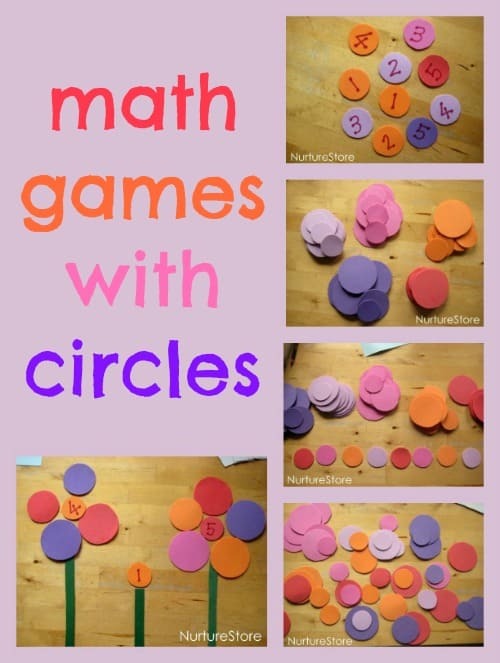 Using toys and other items as manipulatives is great to help them understand this, and adding in new manipulatives every so often keeps the math games fun and interesting. 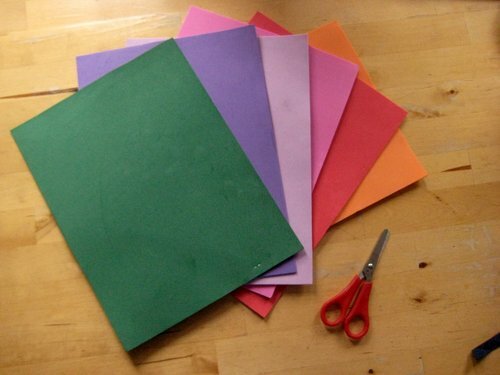 So today, here’s an idea for a really quick-to-make set of DIY manipulatives, and lots of ideas for how you might use them. 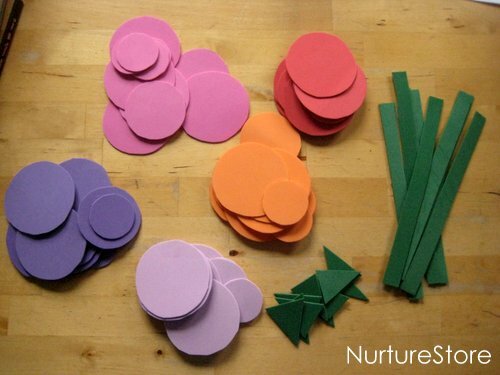 To make our set of shape manipulatives all you need are some sheets of craft foam and a pair of scissors. 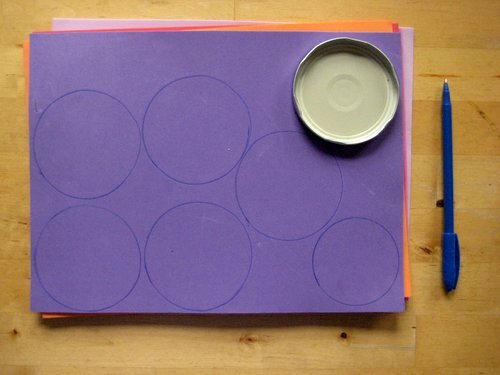 Draw round some lids and cups to make circles: we went with three different sizes of circles on each colour sheet. We added in a few long thin rectangles and some small triangles too, giving us a set of shapes to play with. Simply play with the shapes and see what pictures you can make. 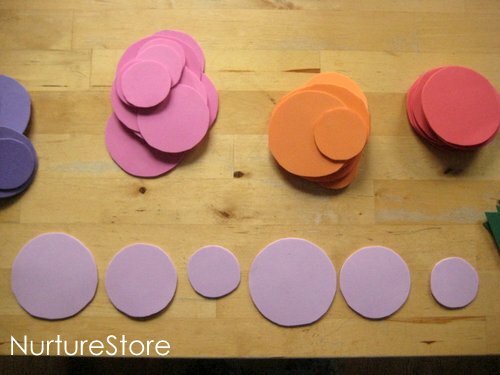 This lets kids explore the properties of the shape they’re working with, turning it over and seeing how it fits with the other shapes available. 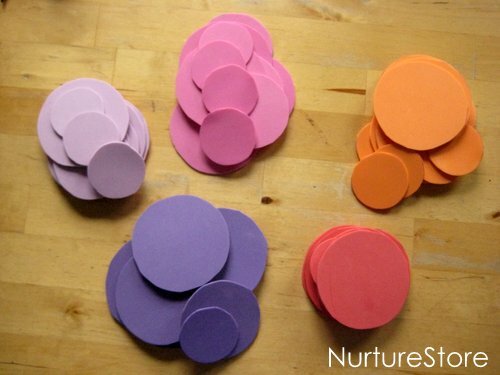 With very young children you can introduce the words round, circle, big and small. 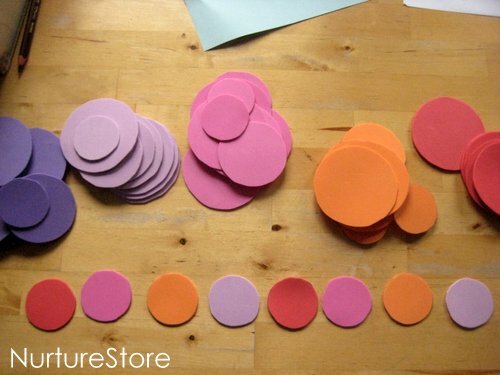 You could sort the circles into piles by colour or by size. 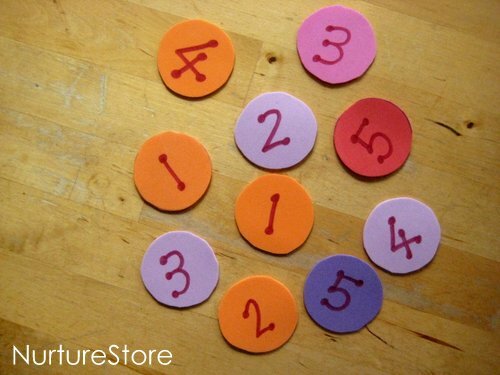 This sort of classification game is an important skill that later helps children with other math and language learning. You could also give each person a colour and see who can collect 10 circles of their colour the fastest – and then count each one. You could see if you can line up some circles in size order and use the words small, medium, big, smallest, biggest, first, second, third. 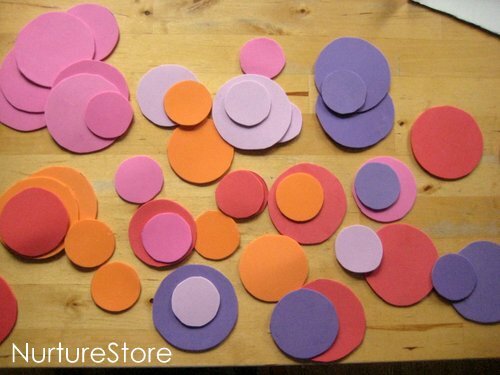 You could try patterning using the colours of the circles, repeating a sequence to form a line. 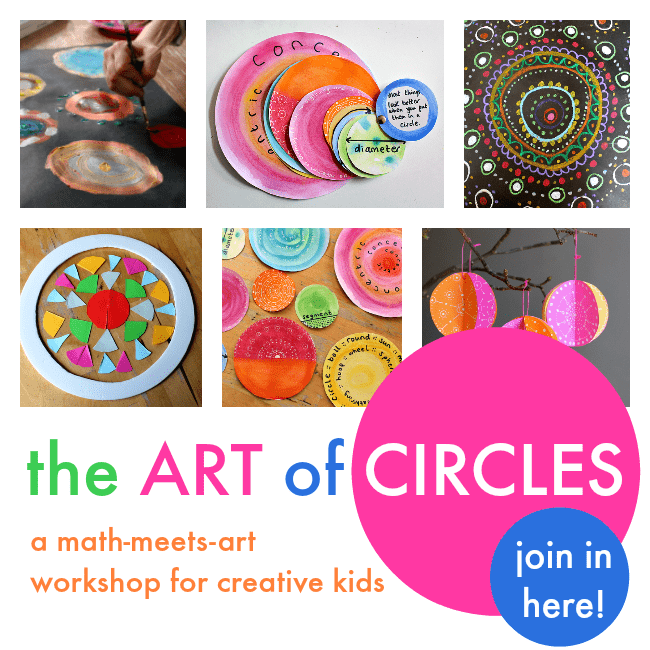 You could use a permanent marker to write some numbers on some of the circles. Then pick a number, see if you recognise the number, and then see if you can count out the right number of circles to go with the digit you’ve picked. Challenge the kids to try and make a picture from the shapes available. Can they make a flower? A face? A house? A creature? 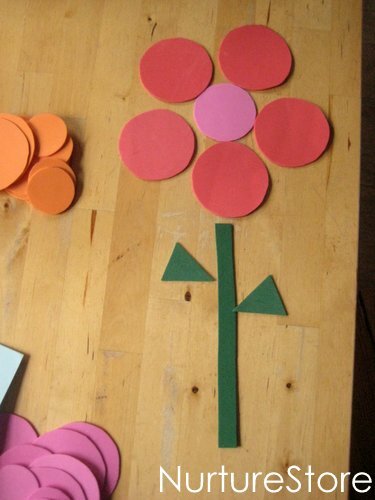 Use the extra rectangles to make some flower stems and add a number circle in the centre. 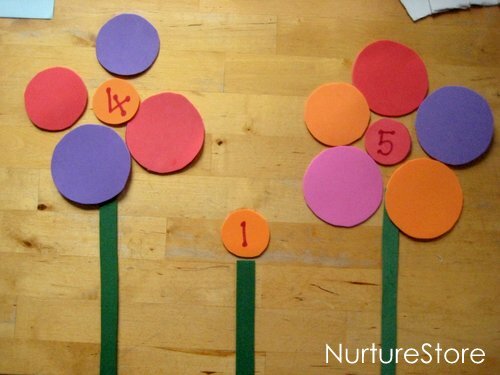 See if you can count out the right number of petals to go with each number flower. 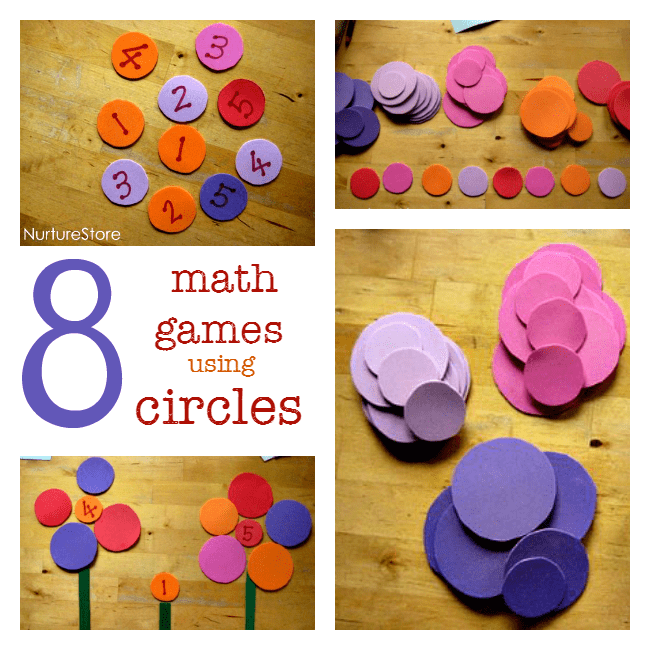 Bonus math game: math in the bath! If you use foam sheets to make your shapes the extra bonus is that they will stick to the side of the bath tub. Just dunk them in the tub and the water will make them stick to the side – then you can play all these games with added splashing. Math in the bath! That is fantastic. I think we are going to be trying that sometime soon! Hope you have fun playing Celesse!